Hammond Model QR-40 | MOSweb Online! The QR-40 is electrically similar to the PR-40 but with utility type cabinet is only used where appearance is not a consideration such as tone and reverberation chambers. 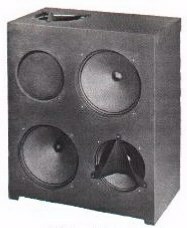 The treble direct speaker is normally mounted in the top. In unusual installations where the ceiling is very low, or cabinets are stacked or radiation is otherwise restricted, it is possible to move this speaker to the hole provided in the front. The metal diffuser in front of the speaker must also be moved and the wooden cover must be attached under the top to close the hole.